Reference number for this case: 27-sep-54-Perpignan2. Thank you for including this reference number in any correspondence with me regarding this case. On September 28, 1954, the regional newspaper L'Indépendant had published an article on a sighting made the day before, September 27, 1954, by a group of seven workmen that the newspaper judged to be "in good faith. " The newspaper noted that the clock showed 03:10 p.m., that the workmen were unable to describe the shape of "the apparatus" because it flew much too fast, in the sky of Perpignan, going towards Spain on the area of Le Perthus. The seven workmen said that the craft made no noise, but that it shone enormously in the sky. Ufologist Aimé Michel indicated in his 1958 book that the workmen were at a factory a few kilometers in the South of Perpignan. Aimé Michel also stated that in Breusy, which is in the suburbs of Perpignan, vintagers had seen a circular object coming fast, and then getting out of sight in the clouds. This might perhaps have been the same case, perhaps another case. reportedly seen yesterday at 03:10 p.m.
PERPIGNAN. -- It is not a "saucer", it is not a "cigar", but an odd apparatus which, yesterday afternoon, was seen in the sky of... Perpignan. Where? It was difficult to obtain a precision by the group of workmen who warned us of this crossing of the heavens of our area. And the seven workmen added that the machine did not make noise, but that it shone enormously in the sky of the Roussillon. This information, after so many others of the same kind, may be one more proof that up there, on our heads and on our craft, strange craft fly. Can we affirm it? Can we deny it? It appears difficult to us to be formal with regard to one of these two question marks. We will simply say that our informers appeared to us of very good faith. Will other testimonies come to confirm their say? According to ufologist Aimé Michel, on September 27, 1954, at about 09:40 P.M., in Perpignan, a small village near the city of Montélimar, three people witnessed two luminous objects crossing the sky in the West and disappearing towards the South. Luc Chastan indicates in his database that in the Pyrenees Orientales (66) on September 27, 1954 at an unknown hour, "at some distance in the South of Perpignan, seven workmen of a factory observed a circular object in the sky which disappears at high speed in direction of Spain." The sources are indicated as: "Ovni, Premier dossier complet... by Figuet M./ Ruchon J.L. ** éd. Alain Lefeuvre 1979" and "M.O.C. by Michel Aimé ** Arthaud 1958". The information by [lc1] is not precise: for the observation of the seven workmen, the hour is known, see [li1]; for that of Breusy, only Aime Michel writes about it, Figuet and Ruchon do not mention it. It is not completely impossible however that the seven workmen in the south of Perpignan and the vintagers of Breusy are in fact the same witnesses of the same observation; unfortunately, for the vintagers there is no trace of the hour of observation. It will be noted that for Aimé Michel these are two distinct observations. To still add to the confusion, I sought in vain in 2016 the place "Breusy" as a suburb or proximity of Perpignan. As for the craft, description is obviously too vague so that a plane, or a meteor, for example, cannot be excluded. Let's note all the same for the same date the alleged CE3 of Lassus, suburb of Perpignan, for which unfortunately the hour is given as "in the afternoon" without any precision. 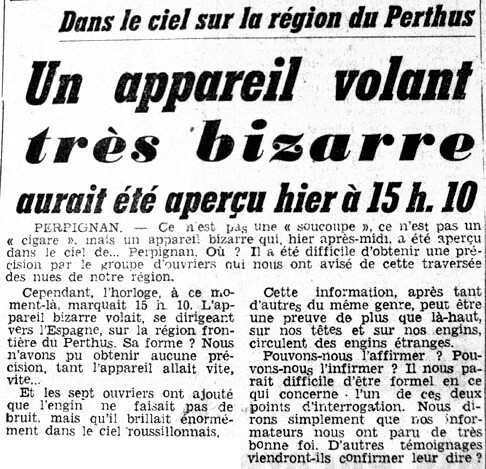 [li1] Article in the regional newspaper L'Indépendant, France, September 28, 1954. 1.0 Patrick Gross February 5, 2010 Conversion from HTML to XHTML Strict. First formal version. Addition [lc1]. 1.1 Patrick Gross October 11, 2016 Addition [li1], Summary, Explanations (were "Not looked for yet" previously). This page was last updated on October 11, 2016.